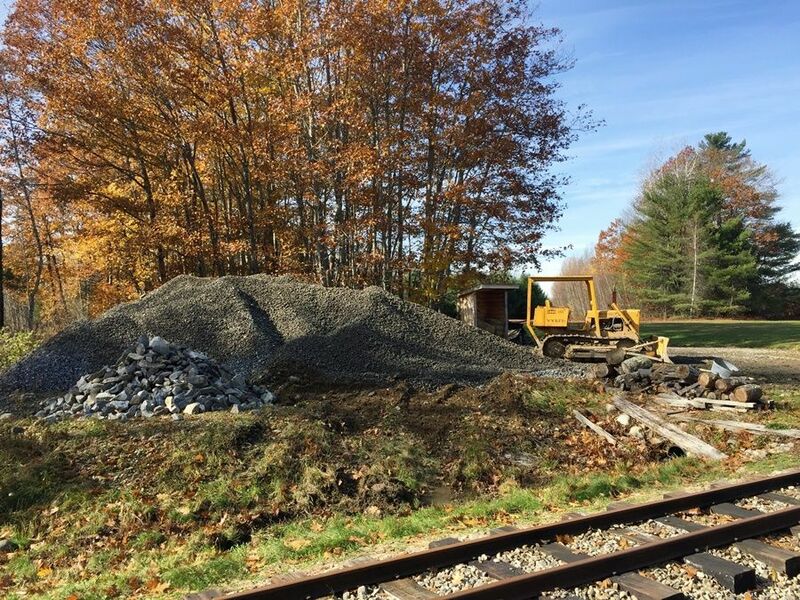 * Track work - Let's eliminate the slow order at the north end of Davis Grade! And perhaps work on staggering the joints at north end of Cockeye curve. * Percival deck - I think Zack has a little bit more to do on it. No passenger trains - the season ended last weekend - and no Albion Day. Wear blaze orange! Side note, tamping limit signs beginning next spring will be fastened to the ties. The signs are laid on the ties for a reason, and its rather important they remain in place. Unfortunate tamping limit signs need to be fastened to the ties, but I saw one of the signs had been moved onto the west side embankment on my last visit, so sadly it needs to be done. Track Work for Saturday 11/3 (tomorrow) still planned. Please dress accrodingly. 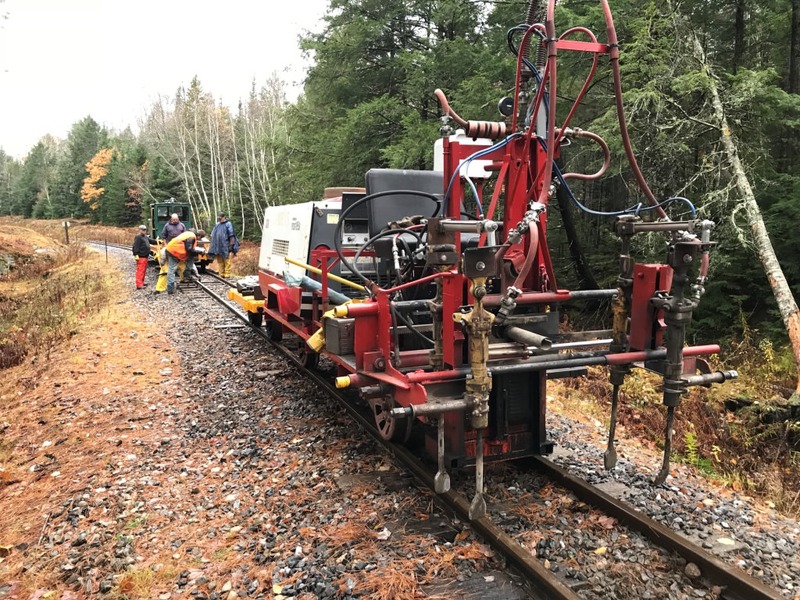 * Track: Jacking and tamping on Davis grade and into the south end of Cockeye Curve. Some track on the curve came up quite a bit. In the afternoon we picked up most of the old ties in the ditch and brought them back to Sheepscot. * Shop: Alan and helpers were putting up bracket holders for the overhead crane in Bay 1. 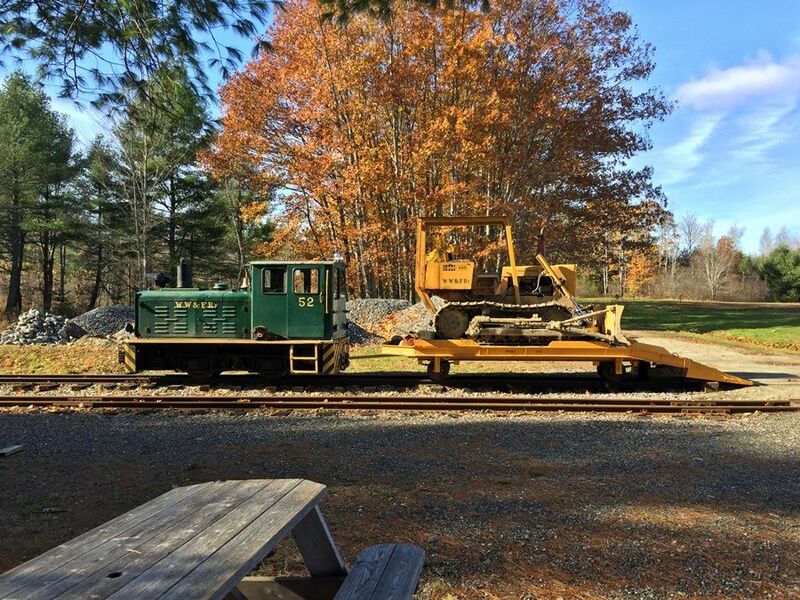 Once we are able to ballast todays tamping I am happy to say that Davis grade will finally be completed with the exception of a few lining spots. Also, thank you everyone for todays efforts. No one let the rain dampen their spirits and we pressed on against the rising waters. Water water every where, and not a drop to drink. Were the new ditches working? The west one was working just fine. The east one not so much, as the tie pile has sort of blocked it. Looking forward to being able to continue ditching. It would be nice if we could put that roadcloth down in the ditch and armor it with stones, so that we wouldn't get vegetation. Today started out to be a good day to work outside -- if you're a fish. The weather did improve a bit as the day wore on. Here are a handful of photos. Most everyone was busy working, so there wasn't much opportunity to take photos during the day. First two photos were taken around 8 this morning. 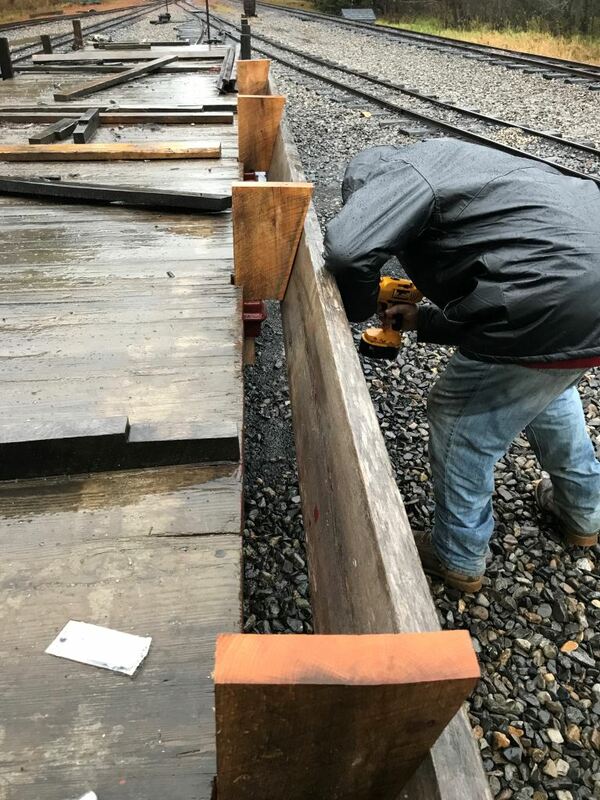 Joe (with assistance from Dana), was installing slanted sideboards to direct ballast on the southern half of flatcar 118 in the pouring rain. A crew of six went out shortly after to Davis grade to lift and tamp the track where needed. The crew consisted of Joe Fox, Dana Deering, James Patten, Jay Barta, Ed Lecuyer and myself. Airman Big Joe (the tamper) went out first, followed by locomotive #52 and caboose #320 (to provide some shelter from the weather, if needed). Sometime between 9.30 and 10, the rain ended for a while, making the morning more pleasant. The rain set back in around 11.30, so it was a good time for lunch. 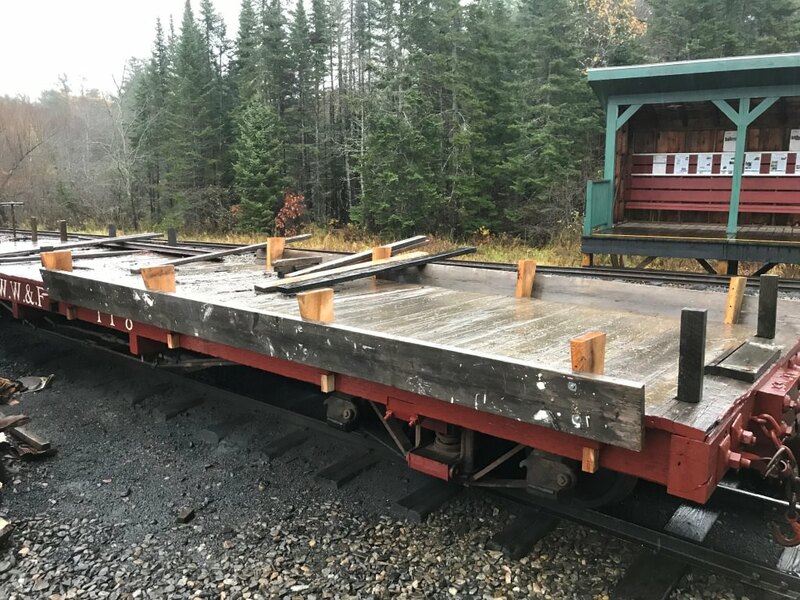 After a good lunch courtesy of Stewart, Dana, Jay and I went back out to tamp, while Joe and Ed used 52 to assemble and bring out the rail gantry and flatcar 118. The rain had passed by then. 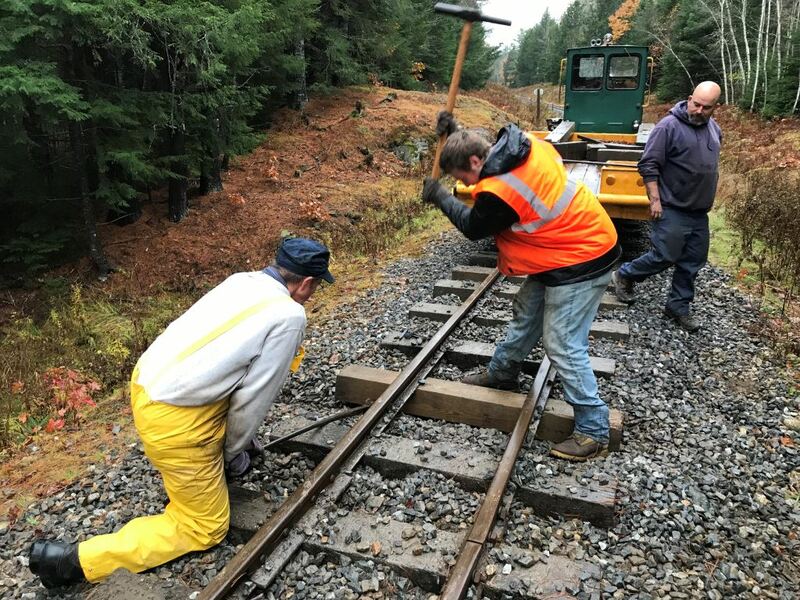 While tamping was underway, a crew picked up most (if not all) the discarded ties along the east side of Davis grade using the gantry train. As to Wayne's question, the west side ditch (cleaned by Mike earlier this season) was running well. The east side ditch was not, in part due to the discarded tie piles. This was noticed in the morning, which led to bringing out the gantry train to pick up the discarded ties. Apparently there had been a lot more rain overnight last night, as the ditches and streams were all running well. It also appears there has been a lot of rain over the last couple of weeks, as the turtle pond on the west side of the track on Davis grade has risen at least a foot since the fall work weekend. Wished I had time to get up to see Humason or Trout Brook today. I hope Stewart can get a sandbar photo of Trout Brook bridge. The rest of my photos were at the end of the day. At the north end of Davis grade around 3.30 p.m. 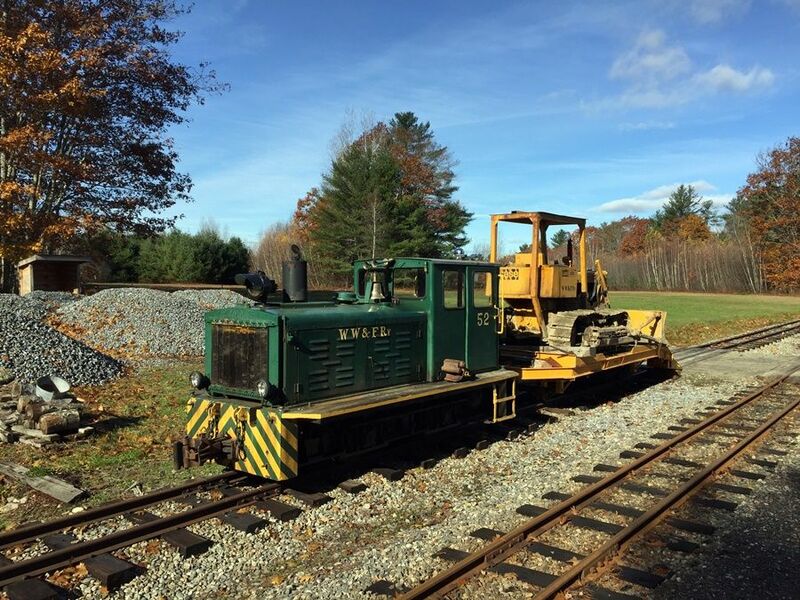 The tamper had put in a busy day and we were nearly done using it. Joe, Dana and others were busy replacing a tie that had been rejected earlier this year. In the background, Brendan Barry had brought up #52 with ramp car #1015 to pick up the last of the discarded ties and other items that needed collection. Joe helped spike the replacement tie, as Dana lifted the tie. Brendan looks on. After the tie was installed, Big Joe tamped it, completing its work for the day. I thought Big Joe ran very well today. 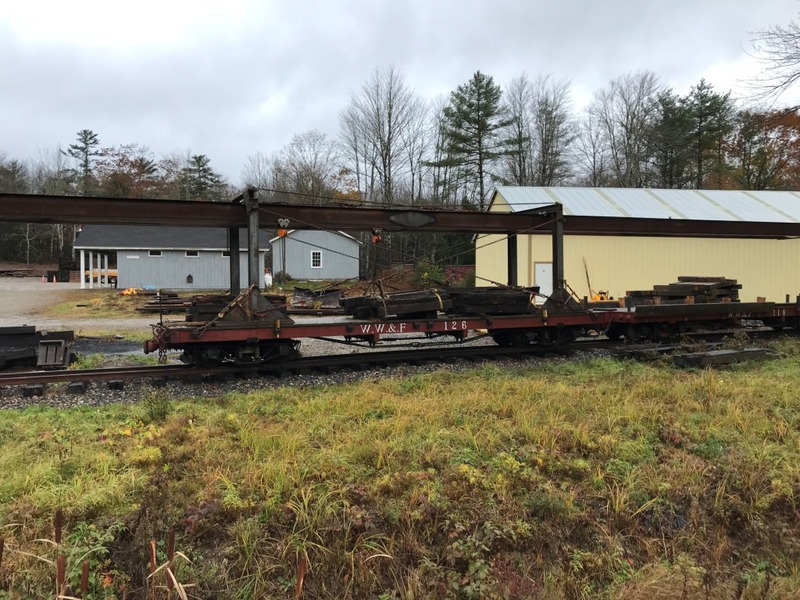 The gantry flat back in Sheepscot, loaded with the discarded ties from Davis grade. I left Sheepscot shortly after 4 p.m. for the drive back to Massachusetts. As I approached Wiscasset, the sun came out. Of course the sun waited until you returned to the "prettiest little town in Maine". Nice going guys. It’s work that had to be done. I appreciate that you all went out in inclement weather. The 14 truck loads of ballast at Alna Center were consolidated into single pile this morning to make room for Santa. You can see all the piles spread out behind 52 and the dozer. For those who hang on 52 during the snow plowing and clearing, you haven't been forgotten. Attached is my Plan B, Rev 3 solution to the hood and roof Handrails mounting hardware. I have modified my methodology to meet the various requirements of the locomotive regs and shown are the parts that are now in the priming and painting process. The parts are a split clamp for the handrails that I left in the attic, a standoff a pair of washers that spread the load over a greater area than the current handrails and a backing plate that exceeds the current hand rail backing plates, along with appropriate mounting hardware. As soon as I finish painting and receive the 1-7/16" double square impact (railroad) sockets that are more durable than the 12 point sockets we were using for the track bolt impact wrench I will send all the parts up to Sheepscot. Regrettably I won't be up until spring so if someone can be persuaded to drill a few holes and turn a few wrenches the snow team will have secure handholds for their winter duties.